www.iinet.net.au/getanimated to vote for The Bushman of Bunyip Billabong. Thanks! Almost 3 years after it was first screened, The Bushman of Bunyip Billabong is still picking up awards. For an article on the Mullet Short Film Festival, click here. This is the 14th award that the film has recieved. Some of these include the 2005 BUFTA scholarship award and best secondary animation at ATOM 2006. For a full list of screenings and awards click here. Every year, Bond University offers a full scholarship to a high school student through their annual film competition BUFTA (Bond University Flm and Television Awards). 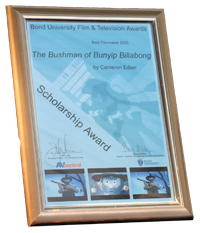 The Bushman of Bunyip Billabong won the overall prize, granting Cameron Edser a full scholarship, valued at over $70,000, to study Film and Television at Bond Uni. The film also won the comedy category. GooRoo Animation have been entering the competition for the past three years, winning the animation category award for Stackhat in 2003 and The Cow-Goat Song in 2004. This year, Bond University flew the finalists to the gold coast to attend the awards ceremony. The trip was an amazing experience and the ceremony was very overwhelming, watching the film on a big screen before being presented with the grand prize. Cameron will begin his bachelor degree there next year.